Season best from Chesapeake Bay! Lightly battered and served with fresh mango pico de gallo. 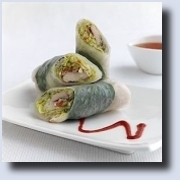 Soft wheat paper wrapped over stripes of grilled chicken, noodles and cool vegetables. Great appetizer! A favorite on Belmont Town Day now on a regular menu. Blend of pork and shrimp dumplings with cilantro root, garlic, and Shiitake mushroom. Perfectly steamed and served with soy-roasted garlic sauce. For true spicy food lover! Salmon & Thai cherry eggplant pan-seared and sauteed with Thai herbs. Krachai, lemongrass, kaffir-lime leaf, peppercorn, garlic, shallot, bird-eye chilies, and basil leaves. Jasmin rice and steamed seasonal vegetables.